Islam Around Us: China launches crackdown after bombing kills 43. 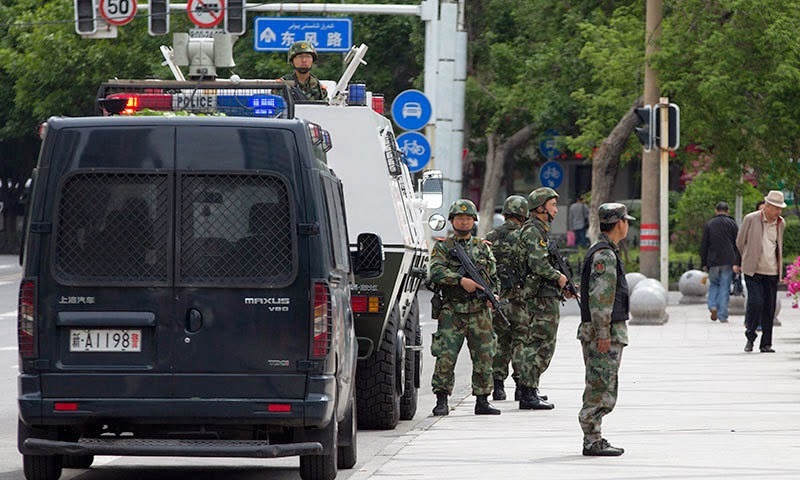 URUMQI | AP | China | 24 May 2014 : : Chinese authorities launched a yearlong anti-terrorism crackdown Saturday in China's Muslim northwest after a bombing in the region killed at least 43 people, while also announcing the first arrest in the attack. Police announced names of five people blamed for Thursday's attack in a vegetable market in the city of Urumqi, and accused them of forming a ''terrorist gang'' at the end of 2013, the official Xinhua News Agency said. Four of the suspects were killed and the fifth was captured Thursday night in an area about 250 kilometres south of Urumqi, Xinhua said. The group ''took part in illegal religious activities, watched and listened to terrorist violence video and audio materials'', according to the news agency. It said an anti-terrorism campaign with Xinjiang ''as the major battlefield'' started Friday. Authorities would target religious extremist groups, gun and ''explosive manufacturing dens and terrorist training camps''. ''Terrorists and extremists will be hunted down and punished,'' Xinhua said. A measure under which passengers at stations in central Beijing are required to undergo security checks will be extended to three additional stations, the city government said. Passengers at all stations already are required to submit handbags and parcels for X-ray examination under measures imposed ahead of the 2008 Summer Olympics in Beijing. Xinjiang is home to the native Turkic-speaking Uighurs (pronounced WEE'-gurs) but has seen large inflows from China's ethnic Han majority in recent decades. Urumqi was relatively calm Friday, with heightened security around the scene of the attack. The market itself was closed and dozens of police armed with automatic rifles and wearing body armour guarded access points. Police banned parking within 100 metres of schools in Urumqi and said drivers can stop only briefly outside hospitals and bus and train stations. The violence was the deadliest in Xinjiang since riots in Urumqi in 2009 between Uighurs and Hans left almost 200 people dead, according to an official death toll. Thursday's attack also was the bloodiest single act of violence in Xinjiang in recent history. Recent attacks show an audaciousness and deliberateness that wasn't present before. Attackers increasingly target civilians rather than police and government targets. In response to Thursday's attack, Xi pledged to ''severely punish terrorists and spare no efforts in maintaining stability'', Xinhua reported. China's top police official, Public Security Minister Guo Shengkun, was dispatched to Urumqi as the head of a team to investigate the attack. Prior to last month's train station attack, Urumqi had been relatively quiet since the 2009 ethnic riots amid a smothering police presence. The sprawling metropolis' population of more than three million people is about three-fourths Han Chinese.